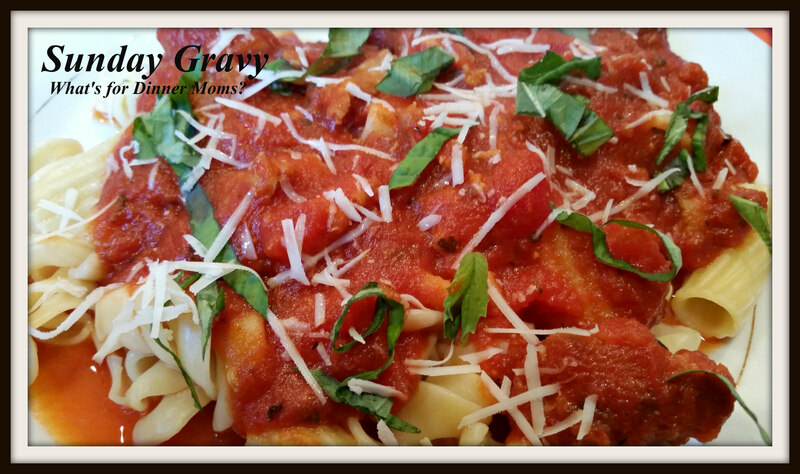 Spaghetti Sauce or Sunday Gravy – What's for Dinner Moms? I have been thinking quite a bit about instincts lately. You know that little voice deep down inside you. Intuition. A gut feeling. Jiminy Cricket. We all have it. Sometimes we ignore it but sometimes we can’t avoid it because it keeps coming back again and again. The times I KNEW I should have turned right when everyone else told me to go left. I went left anyways and it led me off into somewhere I didn’t want to be. The times I looked at my little angels and KNEW they were lying to me despite everyone else telling me, “No, they would never…” I was right. They were lying. I have been thinking about this in terms of cooking. Some people need every ingredient and teaspoon measured and written down. But recipes weren’t always like that. They were passed down family member to family member. A handful of this, a splash of that, taste and adjust. You could tell by stirring a cake or kneading bread what it needed to rise and be light and fluffy. Many of us have lost this ability over time as we have become dependent on recipes and exactly following what we are told to do. Read the comments in some food blogs next time and you will understand what I mean. Is 350 degrees for the oven celsius or fahrenheit to bake this cake? If the gravy doesn’t thicken what do I do? Do I have to use cream or can I use skim milk in this cream sauce? On and on…. I am trying to get my family to this point. Knowing what they like and are able to tell what spices, foods, etc. go together to make the flavors they love. Being able to feel when the gravy will thicken or does it need more cornstarch as they are stirring. That is what this recipe is. I am not Italian in any way, shape or form. My mother and grandmother did not have the big pot of sauce cooking every Sunday like in some homes. Sauerkraut maybe, but not sauce. Many people cook the sauce from their family recipes. I took the pieces of what we like and put them together. I encourage you to taste, adjust and make it your own! My family loved this. They are encouraging me to make it more often. Maybe I will start making sauce variations once or twice a month. I can change the meats – meatballs, sausage or even beef; add red wine, different spices such as oregano or a pinch of chocolate to make it mine. I served this with leftover pasta and a green salad. Cook sausage in a large pot over medium heat breaking the sausage into small pieces with the side of the spoon as it cooks. Once cooked drain extra grease, if any, from pan. Add garlic and saute with sausage for 2-3 minutes until it becomes fragrant. Add tomatoes, basil, onion powder, sugar salt and pepper to pot. Stir and let cook for 3-5 hours over medium low/low heat. Cover after 3 hours. Sauce will reduce and thickens as it cooks. Stir every 15-20 minutes to avoid the sauce from sticking to the bottom of the pan and burning. Just before serving add Parmesan cheese. Stir and taste. Adjust spices as necessary. Serve sauce over pasta with a garnish of Parmesan cheese and fresh basil. You’re so right, I always say that recipes should be a guideline and inspiration to improvise upon. It is sad indeed that such a basic thing as cooking is by now an art to the few. So many people grow up with nothing but take-outs, frozen or canned foods. In my cooking demos I sometimes have to start with such basics as how to boil and egg or how to cook pasta (from a box, with instructions on it… ). I would add cooking classes to elementary school. I think it would be useful on so many levels. My kids still have basic sewing and cooking in 6th and 7th grade but I always wonder how long it will last before they add extra math and reading time. My son actually chose foods for his 8th grade elective once they cancelled Latin because not enough kids signed up. He was crushed that they cancelled Latin. Great post. My husband never uses recipes. I like them for ideas and guidelines but like so many of you, never follow them exactly. But they are good for learning and then innovation follows. Baking is more finicky than cooking. If the science is off you get the no rise baked goods. I totally agree with you too Marci! The Sunday Sauce looks delish! Pingback: Extra Cheesy Baked Ziti – What's for Dinner Moms?